The car carrier City of Amsterdam collided with container ship Conmar Bay at Kiel Canal near Breiholz in Schleswig-Holstein, Germany. According to the water protection police Brunsbuttel the accident occurred around noon on Saturday (April 22) and no-one was injured. 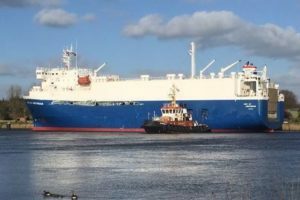 The both vessel were transiting through the North-Baltic Sea Canal in opposite directions, but the gust winds (force 9) pushed the car carrier City of Amsterdam on crossing route with the container ship. The both vessels were unable to maneuver on time and prevent the accident, so the container ship rammed the portboard of car carrier. Several containers from boxship Conmar Bay fell over board and both vessels suffered breaches, but remained afloat without reported water ingress. The car carrier City of Amsterdam was brought to Rendsburg with the help of the Hamburg tug Bugsier 18, whuile the container ship Conmar Bay proceeded under own power to Kiel for special survey and inspection, mooring at the North Harbor. The both cargo ship were detained ans banned from continue of the voyages until further special survey and inspection by the water protection police and experts of the Berufsgenossenschaft Verkehrs. In addition, the classification society (Schiffs-TUV) must confirm the class. The car carrier City of Amsterdam (IMO: 9174751) has overall length of 100.00 m, moulded beam of 20.00 m and maximum draft of 4.70 m. The deadweight of the vessel is 2,779 DWT and the gross tonnage is 9,950 GRT. The ship was built in 1999 by Shin Kurushima Hiroshima Dockyard in Japan. During the accident, the car carrier was en route from from Malmo to the North Sea. After collision, the ship received about 50 m breach in the portboard. The container ship Conmar Bay (IMO: 9458975) has overall length of 151.00 m, moulded beam of 23.00 m and maximum draft of 7.60 m. The deadweight of the vessel is 13,000 DWT and the gross tonnage is 10,585 GRT. The boxship was built in 2012 by Jiangdong Shipyard in Wuhu, China. During the accident, the container ship Conmar Bay was en route to Helsinki. The vessel suffered breaches in the forepack and damages on some containers.